Imagine hiking through the graveyard of an old black diamond mine, wandering along the faultline that caused the 1906 earthquake, climbing through the hills near John Muir’s Bay Area fruit farm, or strolling the gardens of an empire builder’s mansion. 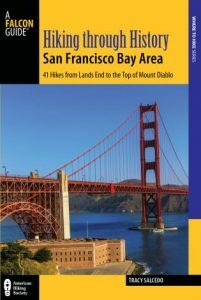 Hiking Through History San Francisco Bay Area: 41 Hikes from Lands End to the Top of Mount Diablo includes more than forty descriptions to hikes that explore the history of the Bay Area, from Mount Saint Helena in the Wine Country to the quicksilver mines of New Almaden in San Jose. 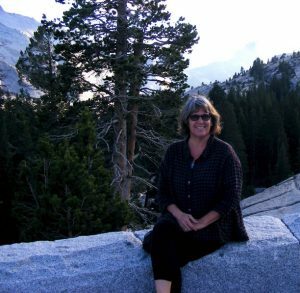 Tracy Salcedo has also written collections of essays exploring the histories of Yosemite National Park and Denali National Park and Preserve. Tracy Salcedo is also the author of Historic Yosemite National Park and Historic Denali National Park and Preserve, Hiking Lassen Volcanic National Park, Best Hikes Sacramento, Exploring California’s Missions and Presidios, and Best Easy Day Hikes guides to the Bay Area and Lake Tahoe. Her family history on her mother’s side goes back six generations in San Francisco.